Suddenly the chamber filled with puppets who listened automatically to a tinny but familiar voice from hidden loudspeakers. "I recognise that Agent chatter," murmured the Wabbit. "Shhh," said Lapinette, "it will soon be time to move." The Voice was glib and certain and it continued smugly. "All voting on Regulation 207/4, hyper-genetic carrots, draw close and prepare to vote the usual way." The Wabbit winked at Pio. "Wait for it," Lapinette frowned. Pio nodded and then cracked his knuckles. All the puppets glanced in Pio’s direction and their arms twitched slightly. The loudspeaker crackled again. "In the introduction of designer GM carrots with anti-wabbit vaccine, all vote "Yes"." But nothing happened and everything was still. The puppets looked at each other and jingled the Wabbit’s coins in their pockets. "It therefore passes into statute, nem con" hissed the furious Voice. “No!” shouted the Wabbit. The puppets froze. “Under the rules of the House, I abstain!” he yelled. “So do I!” said Lapinette and as they both raised their voting arms a forest of abstaining arms rose behind them. "No confidence in the House!" shouted the Wabbit and he flung his fake voting arm on the floor. "No confidence, no confidence, no confidence," repeated the puppets until their voices reached a crescendo that rattled the windows. 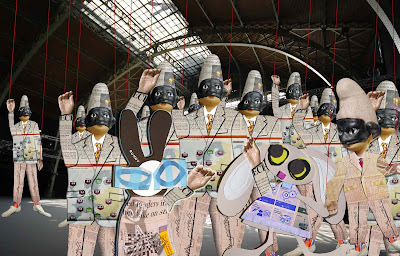 The Wabbit grinned and hopped forward to glare at the place the voice was coming from. "I challenge the House, the assembly is mine," he yelled and turned to the puppets. "Who's in charge?" he shouted. "Wabbit!" they yelled back.